Jocelyn Pascual is walking about on campus in crop leggings, a t-shirt with a thin sweatshirt and flip-flops on a 48 degree day. “It was warm in Chino and the sun was out when I left,” said a shivering Pascual. Other students have the opposite problem, it’s freezing cold in their hometown, like Wrightwood, and then it’s hot at school. Since the university seems to have its own special climate because it is located up against the foothills the temperatures vary greatly just a few miles away. Sometimes the wind is so fierce you feel like you are in a wind tunnel being blown about with your hair standing on end. There is a solution for this dilemma—the university’s own weather station. All you need to do is click on weather.csusb.edu with your computer or your smartphone and you get up-to-the-minute information so you can make an informed clothing choice. The university’s Davis Wireless ProPlus weather station is ready to help. This solar powered unit sends wireless information to CSUSB’s computers and we in turn send it to others including the National Weather Service. The Crestline Soaring Society also benefits from the weather station. You can see their hang gliders and paragliders floating high above the campus near the foothills. They pull information from the website to post on crestlinesoaring.org showing wind speed, direction and temperature. But this piece of equipment isn’t a high priced toy for other companies advantage, it is a technological marvel that keeps CSUSB’s wheels turning with sophisticated sensors to capture temperature and humidity, an anemometer to measure wind speed, UV sensor, rain collector plus many more features. The weather station is kept up and running by Information Technology Consultant Kevin Beecher. He developed the software that makes the information accessible for the non-meteorologist. “The mission of the weather station is to keep the campus safe for occupancy,” said Beecher. By way of explanation, Beecher said the weather station is owned by the campus police. The weather can cause dangerous situations for the student and faculty and our police force is keeping us environmentally safe. There have been two recent instances where classes has been canceled because of 65-70 mph winds. That’s because, a few years ago the Commons Building’s automated sliding doors blew off their tracks. The website offers more information for the weather enthusiast such as the barometric pressure information, indicator of the air pressure and showing if there is a high or low system on its way in or out which can help predict the weather. You can also find out times for sunrise, sunset, moonrise and moonset for each day. If you are concerned about your skin, you can find the UV index on the website too. 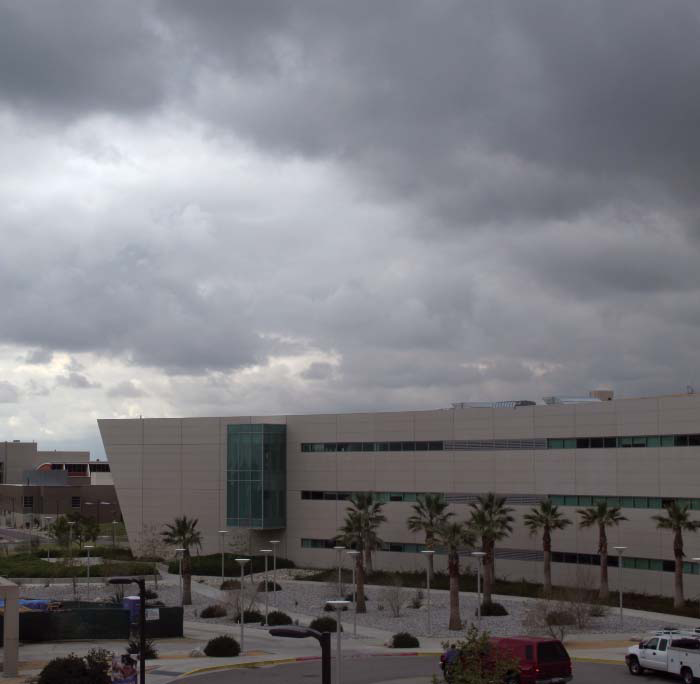 The CSUSB weather station, perched proudly on the north end of campus, is an isolated sentinel watching over the campus communicating high-tech information for keeping everyone at CSUSB informed and safe.